VINERY’S unbeaten triple Gr.1 winner Husson (ARG) had a red letter day at the $10m Magic Millions Race Day at the Gold Coast in early January when two of his progeny won $1m races and another finished second. Husson Eagle won the Sprint (1100m) in race record time after dual Gr.1 winner Lucky Hussler had earlier claimed the Cup (1400m) and Private Secretary was runner-up to I Am Zelady in the Filly and Mare Quality (1300m). These efforts added more than $1.2m to Husson’s earnings this season and took him to 21st spot on the sires’ list with 27 winners of $2.47m. He finished last season with 52 winners of 78 races and earnings of $2.58m (55th). Husson (Hussonet (USA)-Villa Elisa by Roy) began his stud career in Argentina in 2007 and in Australia in 2008 and has 136 winners (55.3% of starters) of 356 races and earnings topping $11.5m. He has 95 winners (5SW) in Australia, while his stint in Argentina produced 31 winners (2SW) from 47 runners plus two winners (1SW) from two runners in Peru. Husson’s first Australian runner was also a stakes winner with Hussousa (Redoute’s Choice) collecting the Gimcrack Stakes. She was one of 11 individual first crop winners in 2011-12 to allow her sire to head the first crop sires’ list by winners. He was also runner-up to Casino Prince (eight winners, $740,960) on the first crop list with earnings of $494,525. He was seventh behind Casino Prince on the second crop list the following season when he had 23 winners of $1.3m (18 of them three year-old winners). He had similar success with first crop juveniles in Argentina including stakes winning filly Lady Hussy (ex Tula by Fortilano). That crop in Argentina also included Gr.3 winner and Gr.1 runner-up Russon (Roar), winner of 10 races and Gr.3 winner and Gr.1 second Sabat Husson (Fitzcarraldo), seven wins. In Australia he has also sired stakes winners Peron (Flying Spur), The Huntress (Western Symphony) and Affable (Redoute’s Choice). The Patrick Payne-trained Husson Eagle (ex Tie Me Up by Royal Academy) boosted his bank account by winning the $1m sprint for Michelle Payne and is among his sire’s 14 stakes placed runners. The $42,500 Adelaide MM Yearling Sale buy from the Patinack Farm draft took his earning past $832,000 and ran 1.01.74, breaking the track record set by Whittington in 2014.
of Anabaa, AP Jet, Tale of the Cat, Singspiel, Shinko Forest and Intergaze. The Greg Hickman-trained Private Secretary, who was runner-up to I Am Zelady (I Am Invincible) in the MM F&M Quality at the Gold Coast, has daughters of Danehill and Secretariat as her first two dams and has earned $348,000 from seven wins to 1300m. Husson’s runners have a winning distance index of 1388m and while his youngsters have a good record at two, they invariably improve with age. on to Cornerstone in SA where he covered 36 mares in 2015 after books of 62 and 89 in 2014 and 2013. Hussonet (1991, Mr. Prospector-Sacahuista by Raja Baba) began his Australian stud career at Arrowfield in 2003 (shuttled to US in 2004) after starting in Chile in 1995. He was that country’s Champion Sire seven times and five times Champion Sire of Two Year Olds and well as a Champion Sire of Broodmares after a brief racing career in the US where he won twice and was Listed placed in seven starts. His Australasian runners included champion sprinter-miler Weekend Hussler, Blue Diamond hero Reaan, Oakleigh Plate winner Eagle Falls, HK Mile winner Glorious Days and Railway Handicap winner Gold Trail. Hussonet showed good speed in the US to be placed at all six starts at two including an Aqueduct Maiden win at 6f, a 2.75 length Allowance (6f) win and a third in a Listed (6f) event at the same track at his final three starts at two in November and December 1993 and was third in the Count Fleet Stakes-LR (8f) at his only run at three in January 2004. He had two wins, two seconds and three thirds from his seven starts. but brilliant sprinter (seven wins in 14 starts including a 6f track record of 1:08.60 in a Listed event at Garden State). Mr. Prospector would go on to be Champion US Sire in 1987 and 1988 and a multiple Champion Broodmare Sire, leaving 177 stakes winners (18% of starters) among the winners of $122m including sires such as Fappiano, Woodman, Seeking the Gold, Machiavellian, Miswaki, Gone West, Forty Niner, Afleet, Crafty Prospector, Distant View, Kingmambo, Damister, Rhythm, Gulch, Geiger Counter, Lode, Jade Hunter, Straight Strike, Smart Strike, Numerous, Mining, Fusaichi Pegasus and Two Punch. Mr Prospector died aged 29 in 1999 and had covered mares that year, getting 43 of his book of 47 in foal. He left 25 crops and 83.6% of his 1177 foals made the track and 63.8% of them won and included 46 Gr.1 winners. His sons ranked as leading sires in most major racing countries and his daughters have produced the winners of $483m including our own Golden Slipper hero and leading sire Flying Spur (Danehill) and 2015 Melbourne Cup hero Prince of Penzance (Pentire). Natalma as his third dam. Danehill is inbred to Natalma, a daughter of Native Dancer (grandsire of Mr. Prospector). Hussonet’s dam Sacahuista (ex Nalee’s Flying Flag by Hoist the Flag) was Champion Three Year-Old Filly in the US and a triple Gr.1 winner of more than $1.2m. Her nine winners also included the Gr.1 winner and shuttle sire Ekraar (Red Ransom). 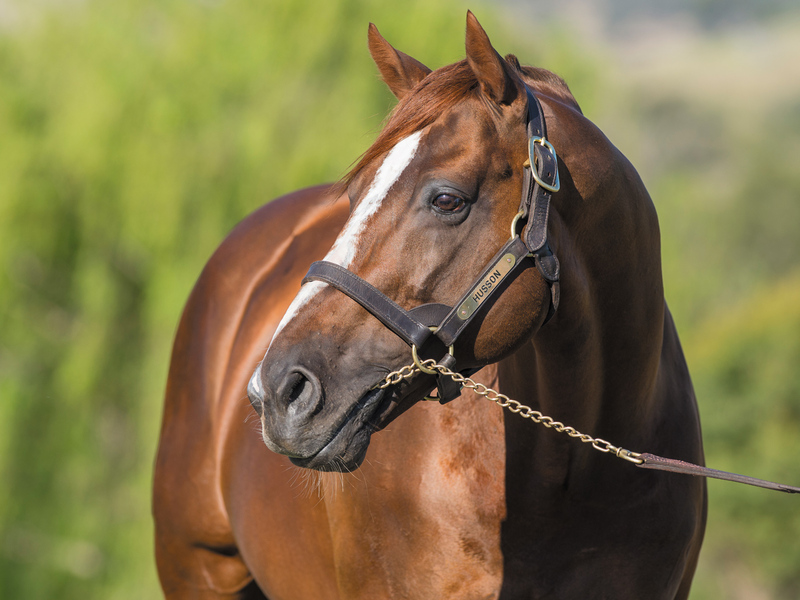 To mid January Hussonet was credited with 754 winners from 955 starters (79%) with 2789 wins and earnings of $67m. His 96 stakes winners (29 Gr.1) represent 10.1% of starters, a figure achieved by only very good sires. Husson is among the best by his sire and was unbeaten in three starts at two. He won Argentina’s first Gr.1 race of the season for youngsters, the Gran Premio Raul y Raul E. Chevalier (1400m) on turf in track record time of 1:18.98 by nine lengths at Hipodromo San Isidro. This followed his eight-length debut win on dirt over 1200m at Palermo. His time in the Gr.1 event was a new track record and one of the fastest in the world for that distance. Husson kept his perfect record intact with his three-quarters of a length victory in the mile Gran Premio Gran Criterium-Gr.1 at San Isidro in 1.32.88. Runner-up Asiatic Boy won the UAE Derby-Gr.2 in Dubai the following season, and third-placed Joe Louis took the Argentine 2000 Guineas at three. A knee injury forced Husson off the scene for the rest of the season, but he was still named Argentina’s Champion Two Year-Old Colt. Husson returned at three with a first-up Gr.2 win over 1600m and then landed his third Gr.1 win for owner Stud Cal Ramon with a 1.5 length victory in the Gran Premio De Las Americas-OSAF (1600m) on dirt at Palermo, running 1:33.97 and remaining unbeaten in five starts. Bred by Juan Carlos Bago's Haras Firmamento, Husson is out of the Chilean mare Villa Elisa, by Roy (Fappiano). Roy (Fappiano-Adlibber by Never Bend), a grandson of Mr. Prospector, won three times in the US and was Group placed before an outstanding stud career that saw him become a nine-times Champion Sire in Chile (between 1991-1999) and a Champion Sire in Argentina (2002 and 2008). He is broodmare sire of more than 100 stakes winners. His third dam Lester’s Pride (Model Cadet) is dam of US Champion Sprinter and sire Shecky Greene (Noholme). The Hussonet-Roy nick, which gives a 2mx4m cross of Mr. Prospector and 5m,5m,6mx5m cross of Nasrullah, proved a popular one for Hussonet during his time in Chile as it also produced Argentine Horse of the Year Host (CHI) (Willow Grove Stud, Woodside, SA) and Chilean Champion Two Year-Old Colt National Park. Husson’s dam Villa Elisa won three races and has produced six winners and his second dam Weekend Dancer (two wins) produced five winners and is by Masqued Dancer (Nijinsky-Bonnie Google by Better Self) and is a half-sister to Gr.2 winner Dolly Toss. This is family 2e and there is a tenuous link to great Australian champion Ajax (Heroic) in Husson’s pedigree. Husson's ninth dam, the Bayardo mare Tussock-Grass, is a half-sister to Meadow Grass, grandam of Ajax and third dam of Lady Pirouette, winner of the AJC Champagne Stakes and MRC Merson Cooper Stakes. Ajax won 18 races straight from November 4, 1937 to March 11, 1939, a period of 16 months. They were all Group class races and included at least 10 that could be classified as Gr.1. The 46 starts of this Widden-Stud bred son of Heroic yielded 36 wins over distances from 1000m to 2400m. Ajax became a very good sire from his use in alternate seasons at St Aubins Stud, Scone and the Widden Stud and would have had greater success if he had not been sold off at the age of 14 in 1948 to America. One of the two buyers was the entertainer Bing Crosby. Husson was acquired for Nathan Tinkler’s then fledgling thoroughbred empire in 2008 after being inspected in Argentina by Andrew Bowcock and stood his first season in the Segenhoe Valley before the Patinack road show moved on to the former Collingrove and surrounding properties at Sandy Hollow. Husson and his stud mate, the Chipping Norton Stakes-Gr.1 winner Casino Prince (Flying Spur), were acquired by Vinery in 2013 as the Patinack thoroughbred holdings began dispersing. “Both Stallions will add great depth to the Vinery team,” Vinery Stud general manager Peter Orton said at that time. Husson stood the 2015 breeding season at $13,200 and covered 70 mares. He served books of 68 and 69 in his previous two seasons after his biggest book of 118 in 2012 ($22,000), current two year-olds.